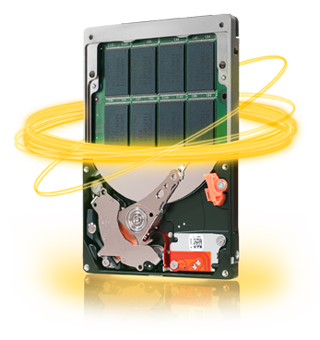 As a refresher, HHDD’s like the Seagate Momentus XT combine a traditional 7,200 RPM 2.5 inch 500GB or 750GB HDD with an integrated single level cell (SLC) nand flash SSD within the actual device. The SSD in the HHDD’s is part of the HDD’s controller complementing the existing DRAM buffer by adding 4GB (500GB models) or 8GB (750GB models) of fast nand flash SSD cache. This means that no external special controller, adapter, data movement or migration software are required to get the performance boost over a traditional HDD and the capacity above a SSD at an affordable cost. In other words, the HHDD’s bridge the gap between those who need large capacity and some performance increases, without having to spend a lot on a lower capacity SSD. However based on my needs or business requirements two years ago I found the justification to get all the extra performance of SSD not quite there when. Back two years ago my thinking was that it would be about two maybe three years before the right point for a mix of performance, availability (or reliability e.g. duty cycles), capacity and economics aligned. Note that this was based on my specific needs and requirements as opposed to my wants or wishes (I wanted SSD back then, however my budget needed to go elsewhere). My requirements and performance needs are probably not the same as yours or others might be. I also wanted to see the incremental technology, product and integration improvements ranging from duty cycle or program/erase cycles (P/E) with newer firmware and flash translation layers (FTLs) among other things. Particularly with multilevel cell (MLC) or enhanced multilevel cell (eMLC) which helps bring the cost down while boosting the capacity, I’m seeing enough to have more confidence in those devices. Note that for the past couple of years I have used single level cell (SLC) nand flash SSD technology in my HHDD’s, the same SSD flash technology that has been found in enterprise class storage. While I wanted SSD’s two years ago in my laptops and workstations to improve productivity which involves a lot of content creation in addition to consumption, however as mentioned above, there were barriers. So instead of sitting on the sidelines, waiting for SSD’s to either become lower cost, or more capacity for a given cost, or wishing somebody would send me some free stuff (that may or may not have worked), I took a different route. That route was to try the HHDD’s such as Seagate Momentus XT. Disclosure: Seagate sent me my first HHDD for first testing and verifications before buying several more from Amazon.com and installing them in all laptops, workstations and a server (not all servers have the HHDD’s, or at least yet). The main reason I went with the HHDD’s two years ago and continue to use them today is to bridge the gap and gain some benefit vs. waiting and wishing and talking about what SSD’s would enable me to do in the future while missing out on productivity enhancements. The HHDD’s also appealed to me in that my laptops are space constrained for putting two drives and playing the hybrid configuration game of installing both a small SSD and HDD and migrating data back and forth. Sure I could do that for in the office or carry an extra external device around however been there, done that in the past and want to move away from those types of models where possible. Are Hard Disk Drives (HDD’s) getting too big? Has SSD put Hard Disk Drives (HDD’s) On Endangered Species List? Ok, nuff said for now, lets resume this discussion in part II.